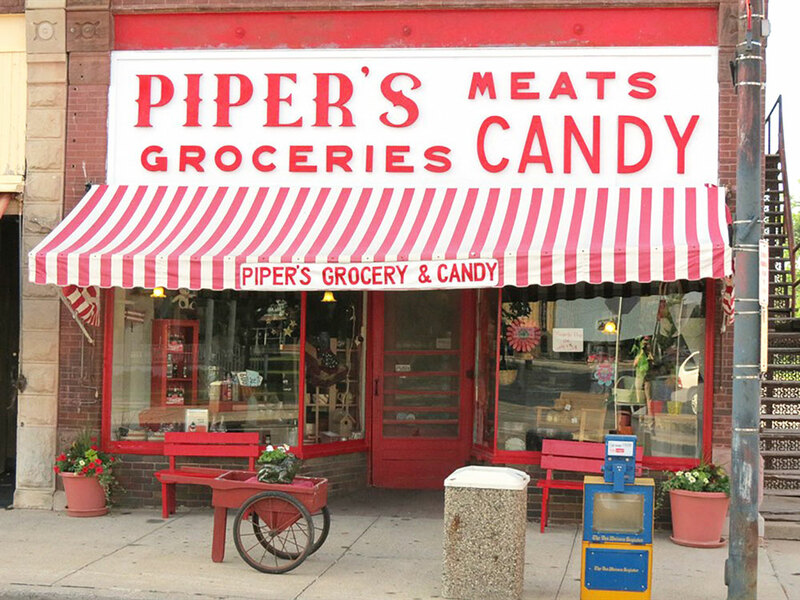 Piper’s Grocery and Homemade Candies has been on the northeast corner of the Chariton square for well over 100 years and has come to be a bit of a local landmark. With its red and white awning, high tin ceiling and original wood floors, it has been an integral part of southern Iowa history and a purveyor of high-quality merchandise for many decades now. From the early days when Joe L. Piper would put in a “line call” announcing the daily specials of fresh cut meats, fresh baked bread or stock groceries to the current full line of deli meats and cheeses, cake donuts (made fresh in the store every morning!) and full line of groceries, Piper’s has always been known for its high quality foods at a reasonable price. The story of Piper’s cannot be told, of course, without talking about the candy. After Joe L. retired, his youngest son Bob and his wife Ruth took over the store and while continuing to offer top quality food products and excellent customer service, in 1947 they added one more thing: top quality homemade candy! Bob learned candy-making techniques from his brother John (who had a shop in downtown Iowa City) and from there developed his own recipes. He had a real knack for it! These are the same recipes and candy-making techniques that are used in Piper’s candy kitchen to this day.